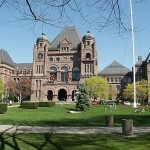 The Legislature adjourned on June 11; MPPs return to Queen’s Park on September 9. The session concluded under the same black cloud created by the gas plant scandals that was hanging over the government when Kathleen Wynne was sworn in as premier in mid-February. The Opposition parties’ almost singular focus on the gas plant issue and the resulting tensions left little room to find the good will and common ground necessary in a minority government to move forward on legislative initiatives. Only two government bills passed during this session: the supply bill and the budget bill. The latter passed with NDP support won through agreeing to budget amendments that included commitments to establishing a Financial Accountability Office, improving support for home care, increasing investment in youth employment, and lowering auto insurance fees. Time will tell whether it will be the Liberals or NDP who reap the political benefits of the amended provincial budget. The latest polls indicate the provincial Liberals and Tories are averaging about 35.5% and 34.2% of voter support respectively with the NDP dropping to 24.3%. Historically, Ontario parties have required at least 38% to win a majority government. Much depends upon how the vote is spread out across the province. The next non-confidence test for the Liberal government will come next spring with the vote on the 2014 budget. The Liberals are unlikely to precipitate an election before then unless there is a dramatic change in the polling trends. Before a general election is likely to occur, Premier Wynne must call three by-elections, two of them by mid-August. Dalton McGuinty’s announcement that he is retiring as MPP for Ottawa South necessitates a third by-election. It is likely the premier will set the Ottawa South date to coincide with the London West and Windsor-Tecumseh contests. Current speculation is that the by-elections will occur in either mid-August or early September. The Ottawa South seat is fairly safe for the Liberals, but they will likely face a challenge in the other two. Even if the Liberals were to retain all three seats, the party would remain one seat short of having a majority. Most pundits credit Kathleen Wynne with having turned the ship around in terms of the Liberals’ sagging fortunes. She has adeptly managed to distance herself somewhat from some of the more egregious political mistakes of her predecessor. And the recent tentative Memorandum of Agreement with ETFO, especially the correction of the 2 percent salary differential, is an indication of how eager the government was to move forward on repairing relations with teachers and other education workers. While Premier Wynne has adopted positions and touted policy positions that point to a new direction for her party, it is too soon to predict what a Liberal election platform will entail. The NDP continues to promote policies designed to appeal to Ontarians feeling stressed by economic pressures. The Tories, meanwhile, have made it clear that, if elected, Ontario would look backward to the days of the Harris government when tax cuts, program cuts, less government, and assaults on union rights and powers were de rigueur. Over the summer months, all parties will be active across the province shoring up their core support and working to expand their appeal. All things point to a fall 2013 session as volatile as the one that just wrapped up.